These images have been inspired by my visit to Bletchley Park, the nineteenth-century mansion near Milton Keynes in Buckinghamshire, England which was once the top-secret home of the World War Two Codebreakers. These pieces are derived from seeing the Bombe machine in operation and hearing the sound that it made as the rotors moved through the various positions trying to find a pattern to start to decipher the codes. 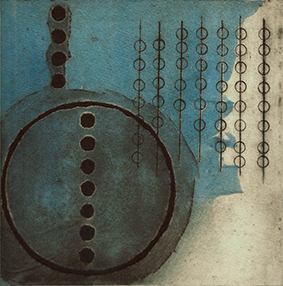 These are limited edition Drypoint and Carborundum prints.